I have recently been researching the work of Frederick Rhead for a future Antiques Info article on Shelley earthenware and china. In so doing, I have been reminded of the work of two of his offspring, Charlotte Rhead and Frederick Hurten Rhead. Frederick Hurten Rhead spent much of his career in the USA, and his 20th century work is rarely seen in the UK. 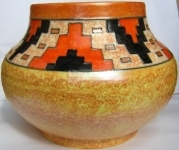 Charlotte Rhead, however, had a distinguished career in 'The Potteries' and remains one of the best-known 20th century British pottery designers. Born in Burslem, Stoke, on 19th October, 1885, Charlotte began her ceramics career at Wardle & Co. While at Wardle's, she became something of a master of the technique of tube-lining. Tubelined Crown Ducal Vases including the Aztec and Turin Charlotte Rhead Designs. Tube-lining, sometimes known as slip-trailing, is a technique whereby the outlines of patterns are applied to a ceramic body using slip (liquid clay) and a syringe-like tube. It's rather like icing a cake! Tube-lining's most famous exponent is probably William Moorcroft - the instantly-recognisable Moorcroft style utilises tube-lining to separate the colours and outline the pattern in slight relief. 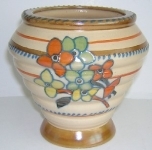 After leaving Wardle & Co, Charlotte Rhead worked for a series of well-known names, including Keeling & Co and Bursley Ltd. (makers of Bursley Ware). In 1931, Rhead started work at AG Richardson, in Tunstall. Her designs were produced under the Crown Ducal brand and were extremely successful. Although she preferred to keep a lower public profile than her younger contemporary Clarice Cliff, Charlotte Rhead's Art Deco designs were extremely successful and remain desirable to collectors today. Anyone interested in learning more about Charlotte Rhead and her work should visit the excellent Crown Ducal by Charlotte Rhead website. This site contains the most comprehensive reference of patterns, shapes and signatures I have managed to find online - including the excellent pattern rarity guide.